This last week while I sat in my chair having coffee, on one of the few sunny days we have had in awhile, I struggled over how much I would like to share the entirety of the Garrison book with others. Not at the end of this year, or early next year, but now. Sometimes the earnestness to share the story tears me up inside, because it is after all, part of what the great commission means to me – to “go tell” others about Jesus and how he’s changed my life. It just happens to be that my way of telling others seems to be really time consuming because it takes awhile to write and illustrate a graphic novel! After which, I felt a familiar nudge saying that, just because the release of the Garrison book is a ways away, it doesn’t mean I can’t share words and pictures that put a smile on my face, comfort in my heart, and could hopefully do the same for others. When I picture myself beyond the Garrison book, I often imagine these one-off illustrations, paired with verses or kind words that bring that kind of joy and honor to Him at the same time. With sketches, verses, illustrations, cards, and stories, I hope to share this Stronghold Art with you as I work on the book, here and on social channels like Instagram and Facebook. Also I’m making the prints and cards available through the Stronghold Art Shop on Etsy. All proceeds help me to continue my work on the book which I appreciate very much! 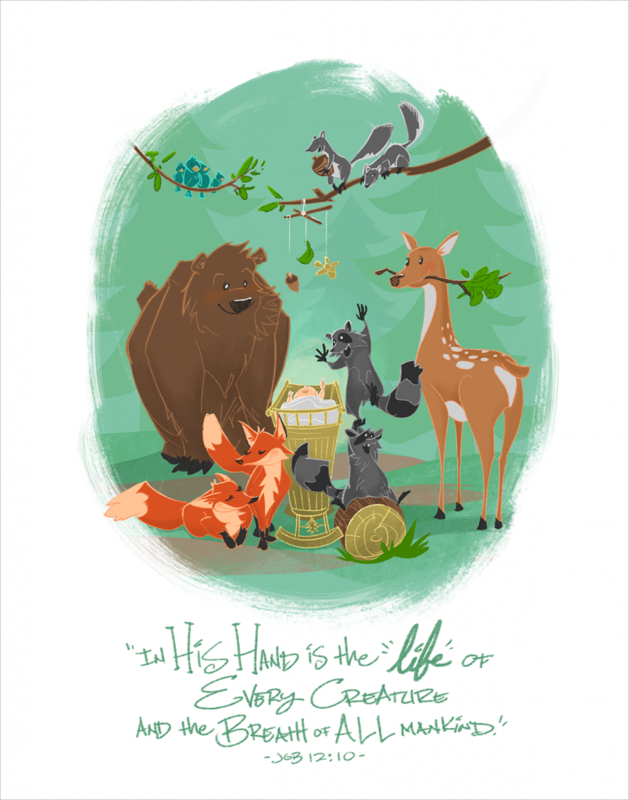 This Woodland Creatures with Baby illustration was created for a special family member with the new baby boy on the way with a forest themed nursery in mind. “In HIS HAND is the life of EVERY CREATURE and the breath of all mankind.” – Job 12:10. How wonderful to think how God has created and has given life to all His creatures, all those of the oceans, jungles, forests, and the cities, towns and homes where we all live. I like to think in Heaven all God’s creations will be in this much harmony. 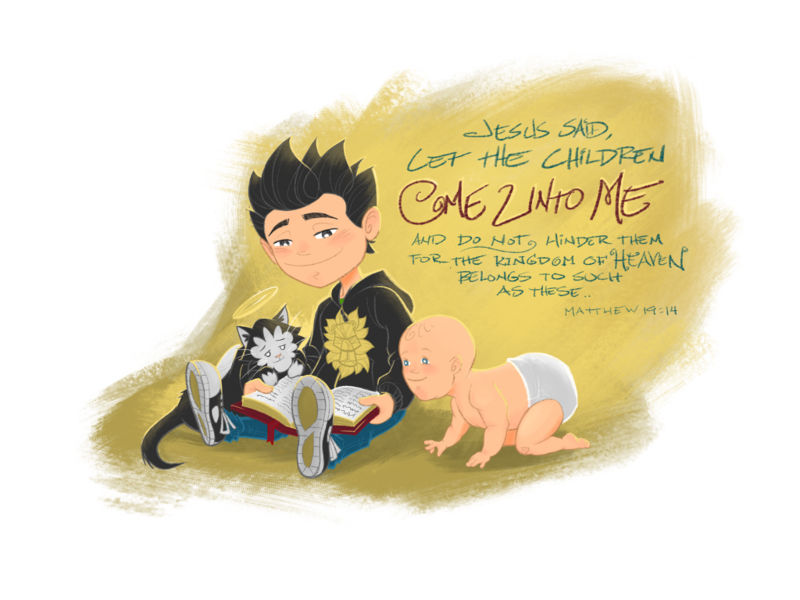 And Jesus said “Let the Children Come Unto Me” – Can you imagine what it was like to hear the God of all creation say these words? – so powerful. When Jesus walked on this earth, he demonstrated a special love for the children. These words are meaningful, in that it shows that nobody should come between and hinder the relationship that a child has with his or her creator. In Leah and I’s journey, God has shown us a passion for kids, even though we don’t have one of our own yet here on Earth, we understand how important it is for all children to have a chance to know who Jesus is.